Vehicle Emission is on the rise in India... May even get worse if not acted upon fast! There is a growing concern about Vehicle Emission in India. Most people in India are talking about this issue, however; many of them may not know about the technicality of the problem. ‘What is the Vehicle Emission problem after all?’ We have explained technically about this growing menace in Indian cities...! The pollutants emitted by an automotive engine during the combustion process are known as Vehicle Emission. Mainly 4 components are emitted. They are – Carbon Dioxide (CO2), Carbon monoxide (CO) and Nitrogen Oxide (NO2) and Particulate Matter or Soot (very small particles black in color emitted by a diesel engine). The Carbon Monoxide (CO) is produced because of incomplete combustion; when there is not enough oxygen to burn fuel. This gas doesn’t have an odor, color or taste and hence; it's hard to detect. It causes fatal air poisoning and is mostly responsible for seizure, coma, and fatality in humans. the combustion process produces the Nitrogen Oxide (NO2). At very high temperatures, especially in a diesel engine’s combustion chamber; the nitrogen in the air reacts with the oxygen and forms nitrogen oxide. NO2 is toxic in nature. It can cause a decrease in the functioning of the lungs and increase the risk of respiratory disease. Particulate Matter: It consists of the substance or particles very minute in size; which exists in the earth’s atmosphere. Soot is one of the substances; which enter the atmosphere as a result of the burning of fossil fuels such as – wood, coal, and petroleum – mainly diesel. It is harmful to humans and causes chronic lung disease, lung cancer, influenza, and asthma. It also increases the risk of coronary artery disease in humans. 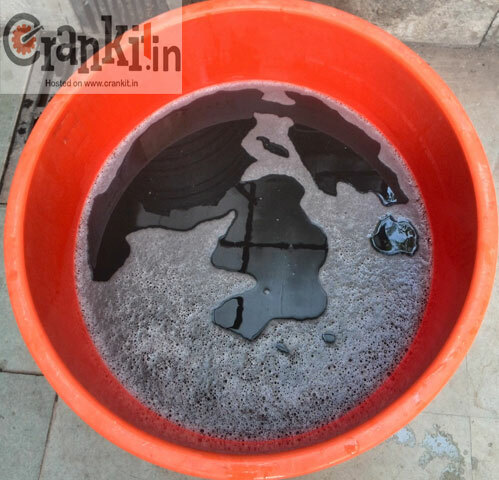 Soot (black smoke) is the most visible among the pollutants and hence gets the most attention. There are many reasons why Vehicle Emission is on the rise in India. One of the reasons is that there is not much awareness among the people who are using some form of an automotive product. Majority of the problem is with old vehicles. Older diesel vehicles, tractors, and generators operated in the country do not conform to the basic emission norms. Most of them will fail the basic test to control the vehicular emission; if tested for ‘Pollution Under Control’ (PUC). People buy an automotive product but ignore its upkeep. They don't carry out the periodic maintenance such as changing engine oil, air filter consistently. This results in an unhealthy engine and it emits black smoke (soot). Congested/dense city areas also contribute to this problem as there is not enough oxygen for complete burning of fuel. Traffic snarls & bumper-to-bumper traffic add to the woes. In heavy traffic, the vehicle’s engines mostly run at idle to slow speed range; which requires rich air-fuel mixture for burning. This leads to more emission. Loose dust and sand particles choke the engine’s air filters frequently; disallowing enough air to come in. This causes incomplete burning of the fuel causing higher emissions. A poorly-maintained fuel-system / unhealthy engine will always release more harmful emission. Poor quality and adulterated fuel do not burn completely. If the diesel is mixed with substances such as kerosene or similar chemicals, it does not burn cleanly enough. This not only chokes the injectors but also causes extensive damage to the fuel system. The quality/grade of the fuel available in most parts of India; is not yet at par with international standards. ‘Pollution Under Control’ (PUC) testing & certification for existing vehicles needs to be revised to – Every 3 months for all diesel vehicles (including state-owned ones) & petrol two-wheelers and Every 4 months for petrol cars to curb pollution. The state RTOs must implement and monitor this rigorously and collect the fines from the non-complaint vehicles. Implement the vehicle emission norms uniformly: Currently, there are different vehicle emission standards in the country – one for Metro cities (Bharat Stage IV or BS-IV) and other for non-Metro cities (Bharat Stage III or BS-III). This doesn’t make any sense; as one can easily buy a BS-III vehicle in a non-metro city and operate it in a Metro city. Making the emission standard uniform across the country will make things easier for the authorities to implement and monitor. For that, the BS-IV complaint fuel must be available everywhere as soon as possible. Reduce the life-span of all the non-BS-IV complaint vehicles to the max. 10 years. After 10 years, making these vehicles either to BS-IV compliant or scrap them. Convert old petrol cars with carburetor engine to CNG. Upgrading Standards: Implementing BS-VI emission standards earlier is the only way forward. The sooner this is done will yield positive results in reducing vehicle emission in India. Pre-pone the implementation of BS-VI emission norms by 2020 as it includes a mandatory on-road testing of new cars to be emission compliant. By doing so, even the automotive manufacturers will also fall in line and will have to upgrade their products subsequently. Raise the penalty for non-compliance of the norms to international standards, so no manufacturer would dare to bypass them. There will be no more situations like the infamous VW Emission scandal, which affected the whole world. How can we reduce Vehicle Emission? The answer to Vehicle Emission problem in India is in the hands of its stakeholders- The authorities, the manufacturers and the vehicle owners. 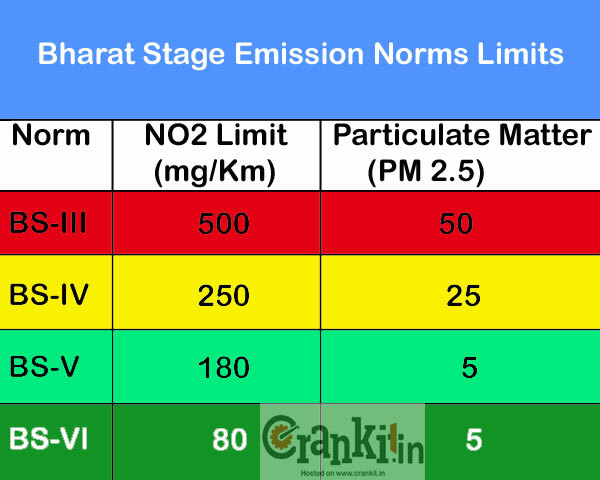 By adapting Bharat Stage-VI (6) will reduce the particulate matter emission by almost 10 times the current levels. The authorities should implement the latest BS-VI norms as soon as possible so as to reduce the impact of vehicle emission. Bringing in the cleaner and more efficient fuels will greatly reduce the pollution. The authorities must strictly ensure the compliance of emission norms by the manufactures. The manufacturers should implement the latest technologies such as fuel injection (GDI) with turbocharging in their engines to curb pollution. The current carburetor technology used in two-wheelers is not emission-friendly and is the major source of pollution. Replacing it with efficient fuel-injection is the way forward. The companies should not wait till the government makes the fuel-injection mandatory, but they should voluntarily implement it in their bikes. The manufacturers should also bring in the new technologies such as the diesel-hybrids and electric vehicles soon. The vehicle owners must also perform their duty by maintaining their vehicles regularly and obtaining a PUC certificate. The drivers should not run/raise their engines unnecessarily; especially when halted at a traffic signal. By restricting the sale of new diesel cars with engine capacity above 2000 cc will make only a little difference to existing pollution, as new engines emit less as compared to old vehicles anyways. Instead, make the fuel-efficient diesel-powered cars a part of the solution rather than part of the problem. Emission compliance of vehicles which are 10 years or older with immediate effect. Removing the diesel fuel subsidy at earliest and make its price at par with international rates. If this is not possible, then taxing all the privately owned diesel-powered cars with engine capacity above 1500 cc by 20% more over petrol cars. This, itself, will discourage buying of diesel-powered cars. Treating all the cars having Kerb Weight over 2000 kg and engine capacity over 2000 cc as Utility Vehicles and taxing them with an extra 10%. This will discourage people from buying cars with big engines. This will also prompt the manufacturers to reduce vehicle weight and make them more fuel-efficient. Subsidizing the mass-transport vehicles such as buses and restricting the diesel MPVs with a seating capacity of 7 and above and register them only as Taxis for the general public. Introducing a 'Vehicle Efficiency Rating System' similar to ‘Energy Rating’ of electrical equipment. The tax rate for vehicles should be decided on their actual fuel efficiency rating. E.g. - vehicles rated with 5-stars to be levied the lowest tax rate and vis-a-vis. The vehicle emission is a problem concerning everyone and we need to handle it together. Whatever effects of the actions we take today may seem hard on us. However, the effects of inaction are far greater on our well-being in the long run. We are sure that the people of India are understanding and will act upon their duties and responsibilities collectively...!